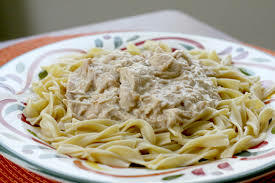 Russian Count Pavel Stroganoff’s (1774–1817) chef is the one who came up with “Beef Stroganoff” in the mid 1800s and named the dish after his benefactor. The original recipe was made with beef and seasoned with French mustard and just a dollop of sour cream. I have taken this centuries-old recipe and altered it to become a delicious high protein, muscle building chicken version of the original that’s perfect to eat a few hours before or after a high intensity weight training session. Cut chicken breast in 1 inch strips and boil in a pan of water until cooked all the way thru, approximately 10 minutes. Drain water and set aside to cool a little bit. Cook noodles according to package directions while chicken cools. In a separate small sauce pan mix, soup, milk, and sour cream and heat until warm. Shred chicken, mix with sauce and noodles. Use unrefined sea salt and pepper to taste. NOTE: It’s always best to use higher carb recipes like this after a few days of going low carb on a weight training day. If your goal is fat loss, you should avoid this type of high carb recipe on cardio or bursting days at least 3 or 4 days of the week.